Initially, the Joint General Staff of the North Vietnamese Army gave order to the Highlands B3 Front Command to conquer the Central Highlands by taking Pleiku City, where II Corps Headquarters was located, by the end of 1965 or the beginning of 1966. In order to have sufficient forces to implement this plan, the Joint General Staff of the North Vietnam Army reinforced the two 32nd Regiment and 33rd Regiments already operating in the Central Highlands with 66th Regiment belonging to 304th Division. The 66th Regiment departed from its base camp on August 15, 1965 and planned to infiltrate South Vietnam through the Ho Chi Minh Trail and to reach its destination by December 1965. But when the United States commenced introducing US 1st Air Cavalry into South Vietnam at Quinhon port in the beginning of October in preparation to move up to the Central Highlands to reinforce II Corps, Highlands B3 Front Command received the order to implement the Winter Spring Campaign within the month of October before the troops of US 1st Air Cavalry were ready for combat, although the troops of 66th Regiment were at their midway and even if they were to speed up their steps, they would be able to arrive at Chu Pong-Ia Drang rear bases no earlier than the beginning of November. Consequently, Highlands B3 Front Command was forced to launch Pleime Campaign with a weaker force composed of two main units, 32nd Regiment and 33rd Regiment. First of all, Colonel Ha Vi Tung, B3 Front Command Chief of Staff, used the "one main attack and two diversionary attacks" tactic aiming at weakening the enemy forces with two battlefronts: the first one at Hoai An District, Binh Dinh Province, and the second one at Pleime, with the main attack to be at Pleiku. By attacking at Hoai An District, Colonel Tung had tied down Task Force 1 Airborne which constituted II Corps reserve force, and forced II Corps to commit all helicopters of US 119th Helicopter Battalion in troop transport in this counter-attack named Than Phong 6 Operation. Colonel Tung had chosen Pleime as the second battlefront because it was 40 kms south of Pleiku and thus out of artillery firepower reach coming out of Pleiku. He intended to interdict II Corps to use the "artillery preceding tanks" tactic. 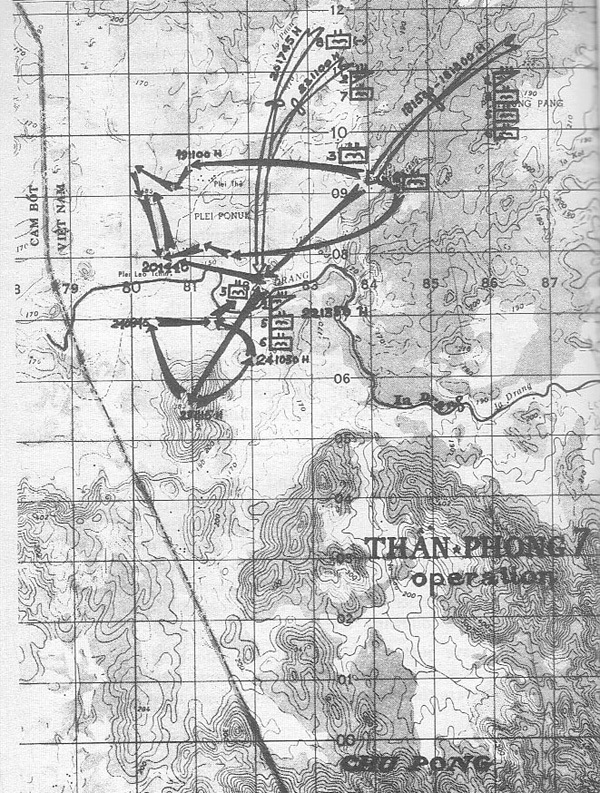 Colonel Tung's plan comprised four phases: (1) 33rd Regiment would surrounded Pleime camp, exerting enough pressure to force Colonel Hieu, II Corps Chief of Staff, to send a reaction force; (2) 32nd Regiment would ambush the relief column and destroy it; (3) Both Regiments would combine force to overrun and destroy the camp itself; (4) Finally, 32nd and 33rd Regiments would join in with 66th Regiment to overrun Pleiku City. In this plan, Colonel Tung used the "attack the camp to destroy the relief column" tactic. In order to force Colonel Hieu to send the relief force by land, instead of by air, Colonel Tung placed two companies of the 14.5 mm anti-aircraft battalion around Pleime camp to shoot down helicopters transporting troops coming to rescue the camp. This tactic would allow him to destroy the relief force more easily and to decimate II Corps troops more rapidly. At the ambush site, in order to prevent his ambush troops to be neutralized by pre-artillery and airstrikes before the relief column appear, as it happened in the Duc Co battle of last August, this time around Colonel Tung used the mobile ambush tactic, by assembling his ambush troops at a staging area not far from the ambush site, and by only dispatching them to the ambush site just a little bit earlier than the relief column. Colonel Tung had also calculated meticulously that Colonel Hieu would not be able to assemble a force larger than a regiment to counter his 32nd Regiment (of about 2,200 men), and would not only be able to pierce through the ambush but would be gobble up easily. Colonel Tung also anticipated that Colonel Hieu would obtain from the Americans one or two battalions for support, as in Duc Co battle where a few units of 173rd Airborne Brigade came to assume the security of Pleiku City. Colonel Tung had set up a well thought plan that would for sure lead him to victory; it seemed that Colonel Hieu would have great difficulty to neutralize his adversary's tactics. Colonel Tung was convinced that he only needed three solid moves to checkmate his opponent. To his big surprise, Colonel Hieu appeared to be a more astute tactician who would dismantle easily his moves. First, based on the development of previous attacks - Thuan Man (6/29-7/1), Highway 19 (7/16-25), Duc Co (8/3-18), Highway 21 (8/19-9/2), Phu Cu, Bong Son, Phu Ly (9/23-10/2), when VC simultaneously attacked Pleime camp and Hoai An District (Binh Dinh), Colonel Hieu guessed immediately that Colonel Tung was applying the "one main attack and two diversionary attacks" tactic, with the main attack aiming at Pleiku, the primary diversionary attack at Pleime and the secondary diversionary at Hoai An, and he recalled General Vinh Loc who was present in Binh Dinh to command Than Phong 6 Operation as a counter attack operation in Hoai An District back the II Corps Headquarters. When he noticed that the VC attacked Pleime camp with the size of a regiment and yet did not exert effort to overrun it immediately, Colonel Hieu knew right away that Colonel Tung was applying the "attack the camp in order to destroy the relief force" tactic, aiming at exerting enough pressure on the camp to lure the main force out of Pleiku City in order to destroy it with ease. And when he noticed that Colonel Tung used 33rd Regiment, which was a regiment relatively inexperienced in combat for newly infiltrated in the highlands, to attack Pleime camp while he used 32nd Regiment, which was more experienced, having been in South Vietnam since January 1965 and having conducted several battles in Kontum and Pleiku, such as Plei Kleng (3/65), Le Thanh (6/65), and Duc Co (8/65), to set up ambush, Colonel Hieu concluded that Colonel Tung's main attack was aimed at the relief force, and his secondary attack was aimed at Pleime camp. In order to make Colonel Tung think he felt into the trap, Colonel Hieu assembled a rescue force immediately the next day following the attack of the camp and subsequently he dispatched a combined team of Vietnamese and American Special Forces to the camp by helicopters, hoping that Colonel Tung would believe that a link between this combined Special Forces team and the relief column was about to happened that afternoon of 10/21. This combined Special Forces team was inserted at 5 kms north of Pleime camp with two purposes: one was to scout Colonel Tung's troop distribution around the camp and two was to lend confidence to the camp defenders that they were not abandoned by II Corps. When the combined Special Forces team, on their way to the camp, discovered several well dug in anti-aircraft batteries and that the enemy troops were scattered around the camp to avoid been targeted by air and artillery strikes, Colonel Hieu understood that 33rd Regiment's mission was to interdict him to rescue the camp by air and to force him to organize a relief column by land. When the recon teams he had dispatched out on 10/21 reported to him they did not discover any ambush sites, Colonel Hieu knew that Colonel Tung was using the mobile ambush tactic in order to avoid damages to his ambush troops by pre-airstrikes, a lesson Colonel Tung had learned following the ambush attack at Duc Co last August. Colonel Hieu gave order to the relief task force of LTC Luat to linger in the vicinity of Phu My instead of rushing immediately to Pleime camp, waiting for the enemy to show up at the ambush site first. Colonel Hieu also needed to buy time for helicopters of 119th Helicopter Battalion to be freed from the ongoing Than Phong 6 Operation in Binh Dinh and available to transport 1/42 Battalion from Kontum to reinforce the relief task force which comprised only 1,000 men, an insufficient force to counter the ambush force of 32nd Regiment. Furthermore, Colonel Hieu was waiting the approval of US Alpha Task Force Command to bring in American troops to secure Pleiku airfield and Pleiku City in order to relieve 22nd Ranger Battalion so that it could reinforce the relief force by landing down south of the ambush site, creating an anvil/hammer tactic against 32nd Regiment. It was only after obtaining report from the recon teams that units of 32nd Regiment started moving from staging areas toward the ambush site that Colonel Hieu gave order to the relief task force to leave Phu My in the direction of Pleime camp along Provincial Route 5B. Colonel Hieu also requested the newly arrived US 1st Air Cavalry to use its huge helicopters to transport artillery tubes (of Battery B, 2/17th Artillery) to Phu My in order to apply the "artillery firepower preceding tanks' attack" tactic, an element Colonel Tung was not able to anticipated while drawing up his plan of ambush. As a matter of fact, when the relief task force reached midway approaching the ambush site, Colonel Hieu gave order to LTC Luat to stop his relief column to allow pre-scheduled artillery and air strikes to destroy enemy ambush positions before the relief column resumed its advance toward the camp. Failing to destroy the relief force, Colonel Tung was forced to order 32nd Regiment to retreat to the rear base at Chu Pong, and to abandon the plan of joining force with 33rd Regiment to attack the camp. Meanwhile, 33rd Regiment also received the order to retreat. After succeeding in maneuvering out of being checkmated, it was Colonel Hieu's turn to make the move to counter-attack Colonel Tung. In the past, after rescuing a camp, Colonel Hieu did not have the means to pursue the enemy in retreat. But this time, with the arrival of US 1st Air Cavalry equipped with all types of helicopters in the Highlands, Colonel Hieu persuaded the American military high command to allow US 1st Air Cavalry to join forces with II Corps Command in the pursuit of the enemy to its very heart located in Chu Pong massif, US 1st Air Cavalry in the role of the main force and VN Airborne Brigade in the role of reserve force. Colonel Hieu made arrangements for VN Ranger Special Forces teams to accompany all units of US Air Cavalry going out on a search and destroy mission. He also shared all intelligence information gathered by II Corps general staff pertaining to enemy troops' whereabouts from radio listening stations, from VN Ranger Special Forces teams and from interrogations of VC prisoners and ralliers. 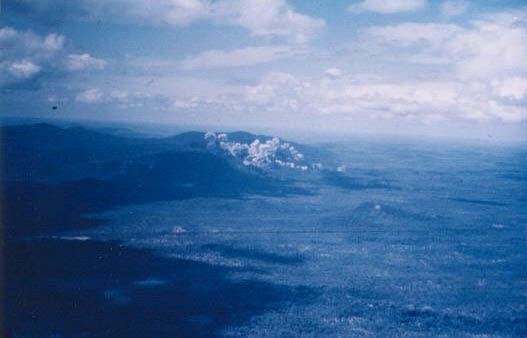 At first, Colonel Hieu proposed that Eagle Flights team of US 1st Air Cavalry pursue the enemy troops from east to west, meaning from Pleime camp to Chu Pong massif. Then, when it was known that all troops of 32nd, 33rd and 66th Regiments concentrated in Ia Drang Valley, with 66th Regiment on the south side of Ia Drang and 32nd Regiment on the north side of Ia Drang and 33rd Regiment at east of Chu Pong massif, Colonel Hieu suggested to General Kinnard a diversionary tactic in ordering US 3rd Air Cavalry Brigade to replace US 1st Air Cavalry Brigade and to switch the operation's emphasis from west to east, meaning from Chu Pong massif toward Pleime camp, inducing Colonel Tung in believing that the American troops had lost trace of his troops. With that belief, Colonel Tung made plan for the second phase of Pleime Campaign to attack for the second time Pleime camp. This time, Colonel Tung planned to use all three 32n, 33rd and 66th Regiments with the support of one 120 mm mortar battalion and one 14.5 mm double barrel anti-aircraft battalion on its way down the Ho Chi Minh trail which would be present at the battlefield on D-day set for 11/16. And this time, Colonel Tung intended to overrun the camp instead of using the "attacking the camp in order to destroy the relief force" tactic. 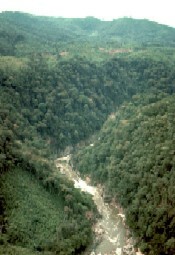 Colonel Tung did not anticipated that Colonel Hieu would attack first with a preemptive strike two days earlier, on 11/14, with units of US 3rd Air Cavalry resuming pushing west and landing at the foothills of Chu Pong massif. Although caught by surprise, Colonel Tung was able to react by having battalions of 66th Regiment engage US 1/7 Air Cavalry Battalion of LTC Hal Moore. Colonel Hieu noticed that Colonel Tung did not position any crew-served weapons from the hills which dominated the LZ to support his counter-attack. Colonel Hieu concluded that these heavy weapons had been destroyed or lost in the first phase of the attack on Pleime camp. How lucky the US 1/7 Air Cavalry Battalion had been because otherwise, the troop landing would encounter tremendous difficulties for the helicopters would have been shot down by anti-aircraft guns positioned on hill ridges and the formation of units of US 1/7 Air Cavalry Battalion would be dismantled by VC mortars taking precise aims from the hills before the ground attack. Instead, Colonel Hieu noticed that Colonel Tung had to resort to "human waves" tactic. Besides the attacks conducted by units of US 3rd Air Cavalry Brigade, Colonel Hieu also coordinated with US Air Force to use strategic bombers B-52 to take part in the battle with five daily bombardments of the Chu Pong massif from 11/15. B-52 targets also included LZ X-Ray on 11/17. On 11/17, Colonel Hieu estimated that the numbers of Colonel Tung's troops KIA amounted to 6,000 combatants, approximately 2/3 of the total of troops committed in Pleime Campaign. Among these losses, 33rd Regiment suffered the most, then 66th Regiment. 32nd Regiment so far suffered the least losses because it had been avoiding any contacts with elements of US 1st Air Cavalry during the pursuit phase. 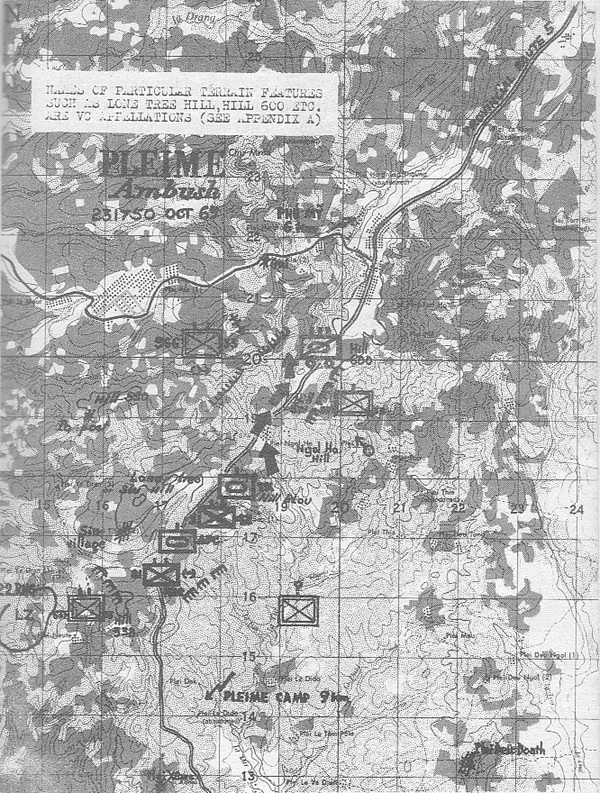 If considering around 400 VC combatants were KIA in the vicinity of Pleime camp and at the ambush site throughout Dan Thang 21 Operation, around 1,000 throughout All The Way Operation, and around 2,300 at LZ X-Ray and at LZ Albany throughout Silver Bayonet Operation, the B-52 bombers accounted for 2,000 VC KIA. Because 334th Battalion and 635th Battalion, the two remaining of 32nd Regiment, were located on the north side of Ia Drang river and next to the Cambodian border, it was politically risky to let the American troops operate near the border. Consequently, Colonel Hieu decided to use VN Airborne Brigade to execute the final counter move for the knockout punch. First, Colonel Hieu requested that US 1st Air Cavalry established a new artillery firepower base (with Battery C, 2/17th Artillery) located at LZ Crooks north of Ia Drang to support Operation Than Phong 7 pursuing the last two battalions of Colonel Tung. Next, Colonel Hieu had the entire VN Airborne Brigade, scattered in Saigon, Bien Hoa, Vung Tau and Phu Yen, transported to a location north of Ia Drang river, with the mission of channeling these two battalions toward the ambush site set at the last corridor that could be used to escape to Cambodia. The Airborne Brigade, under the command of LTC Ngo Quang Truong, performed two ambushes: the first one on 11/20 at 1440 hours (killing about 200 VC), and the second one on 11/24 at 0945 hours (killing about 65 VC). The Pleime Battle with its three phases Pleime-ChuPong-IaDrang ended on November 26, 1965 evening. The Dien Bien Phu Battle which ended the Indochina war (1947-1954) lasted for two months but was merely an encirclement of a stronghold in the Dien Bien Phu Bowl. The Pleime Battle, quite different with many tactical aspects: Envelopment, Counter-ambushes, Relief, Pursuit, Ambushes, Exploitation, Attack and destroy, is no doubt the biggest battle from the last years. * We Were Soldiers Once� and Young, General Harold G. Moore and Joseph L. Galloway, Random House, New York, 1992.